Studying from midnight to sunrise helped Aviwe succeed. Saturday school classes run by an award-winning Grahamstown youth project are helping youngsters realise their post-matric dreams. Counting the days until she starts her accountancy degree at nearby Rhodes University, Aviwe Menze, 17, vows she would not be the 2013 highest matric achiever in the district’s historically disadvantaged schools if she had not spent years attending the acclaimed Upstart Youth Development Project Saturday morning academic support classes. “It changed my life forever,” she enthused yesterday. Living crammed in a small Joza house with her mom, gran, aunt and five siblings, Menze said the way she achieved her three distinctions was by sleeping all afternoon and studying from midnight to sunrise when the house was quiet. Besides the Saturday classes run by volunteers from Rhodes and local private schools, Menze said activities like visiting game reserves, interviewing icons like Archbishop emeritus Desmond Tutu, learning computer skills and visiting the university had helped realise her dreams. What makes the TEM Mrwetyana Secondary School pupil’s achievements more remarkable is that her distinctions are in difficult subjects like accountancy, business studies and life orientation. Her other subjects were all in the 70% range, with her lowest being 68% for mathematics. Badat said about 26 pupils a time attended the Saturday township classes throughout the year. Besides syllabus subjects, pupils also learnt critical thinking skills and were assisted with career guidance like completing university forms. Badat praised Claudia Chandler, geography head at St Andrews College, for mentoring Menze – even helping her with essentials like food, an internet connection and shoes and makeup so she could attend her matric farewell. She said Menze had written in the November 2013 edition of Upstart about challenges she faced at school including teacher and textbook shortages and missing closing dates for bursary applications because her school only issued progress reports at the beginning of the third term. However, she also wrote she used the lessons learnt at Upstart to remain focused and motivated. “In a schooling system that still fails too many of our talented youth, Aviwe’s excellent matric pass is testament to her determination and guts to succeed despite many odds, including having to look after two younger siblings,” said Badat. Picture: SUPPLIED. 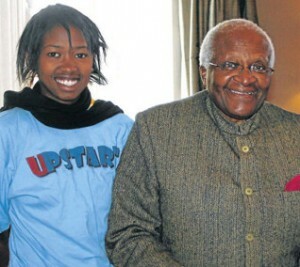 Picture Caption: REACHING FOR THE STARS: Top matriculant Aviwe Menzi says interviewing Archbishop emeritus Desmond Tutu in 2010 helped drive her forward. Click here for more information on Rhodes University.